On Sherwood’s 18-hole, par 3 course, balls can land in wildflower beds, native plant areas, or plop right into the Little River. Fun and challenging for all ages and skill levels, the course is open to the public year round. On this course you may find llamas carrying golf bags, and bluebirds nesting in boxes along the fairways. The Golf Course’s fairways are located along the banks of the scenic Little River. 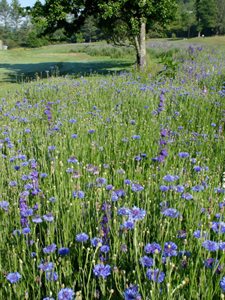 Native plants and wildflower beds make this course a delight in every season. Birds nest in the growth along the river, and boxes along the course attract bluebirds. Men’s and women’s leagues play weekly. 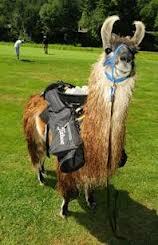 Golf carts are available, of course, but llamas are also sometimes an option for hauling bags and clubs. Sherwood’s course hosts the annual “Llama Rama” tournament, to benefit a local charity. The Robin Hood Centre is at the heart of the Sherwood community. The Oak Room is used for lectures and large meetings, but transforms quickly into a space for group exercise, dancing and yoga. A full kitchen makes it possible to host dinners at the Centre occasionally. 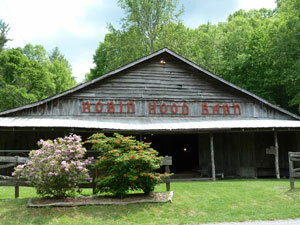 The Robin Hood Barn has a long history of music, theater and dance. There is probably no better symbol for this community than this large, chestnut building which has remained—through careful tending—from the days when Sherwood was a working farm. (The current golf course was once grazing fields for cattle). Summer picnics draw hundreds of residents and their families for music, good food and games. 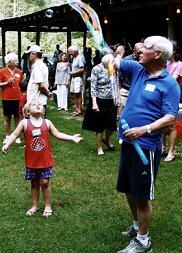 Children take center stage at the 4th of July celebration—with a flag parade, water balloons, bubble blowers, and magicians. A putting contest is the traditional finish to the day’s events. Residents gather for the annual membership meeting at the barn—a chance to greet newcomers, hear about Association projects, and vote on issues affecting the community. Every other year, the forest holds a flea market in the barn, with proceeds supporting local charities. This rustic old building has seen a lot of weddings and receptions, square dances, cookouts and family gatherings. The Barn is available for private occasions by rental to SFHA members only. 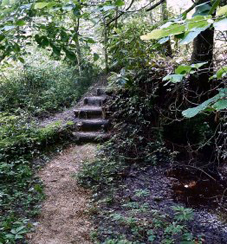 Hikers find Sherwood’s 20+ miles of trails both challenging and beautiful. 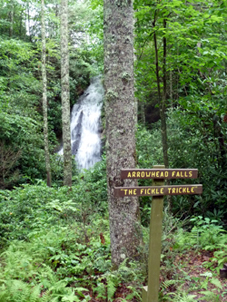 Middle Mountain Trail ascends to 3,300 feet, offering a panoramic view of the Blue Ridge Mountains along the way. Feed Rock Trail climbs to an unusual granitic dome, then descends sharply past caves and a hidden waterfall. Hikers head to Greenwood Trail for wildflowers in the spring, and Perimeter Trail when the leaves change colors in the fall. Each trail delivers a unique forest experience. Guided nature walks expand knowledge of the ferns, flowering plants and trees which live in this varied ecosystem, and birders delight in the sounds and sights along the trail system. F ive spring-fed lakes in Sherwood Forest give residents a chance to canoe, fish and swim in bracing mountain water. Swimmers often head for the smallest lake -Boot Lake, while the docks at Betty Kay and Trout Lakes prove irresistible to those looking for fish. Small sand beaches provide a launch point for young swimmers, and playground equipment at Trout is a favorite spot for families. 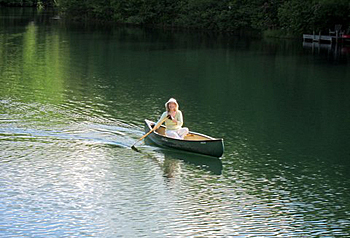 Two Sherwood canoes are placed at each lake for use by residents. Each spring a lottery awards rack space for privately-owned canoes. Families head for the heated pool from May to October. Early morning lap swimmers clear out in time for the water aerobics class three times a week. Ping pong and shuffleboard are also available at the pool. The pool is rarely crowded, and often swimmers have the water to themselves. Private, restful and refreshing…there’s no better place to be on a warm summer afternoon. After 7:00, the pool is a place to enjoy a glass of wine with friends or meet for an al fresco dinner. Cool summer mornings find action at the tennis courts. The courts were recently re-conditioned to assure an ideal playing surface. Match play is scheduled twice a week. 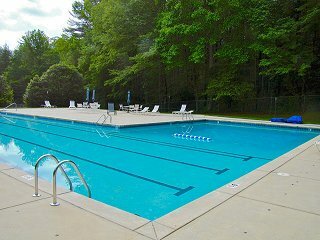 It is an easy walk from the courts to the pool. Gardeners grow organic fruits, vegetables and flowers at the Garden Plots. Perennial flowers such as bee balm, milkweed, calla lilies, daisies and black eyed susans grow in profusion. Serious farmers grow blueberries and grapes, and find the location perfect for raspberries. A volunteer-built shed houses tools and supplies, and a shared water system provides irrigation as needed. Residents can choose to manage a small or large garden plot.